We’d love your help. Let us know what’s wrong with this preview of Clouds of Witness by Dorothy L. Sayers. To ask other readers questions about Clouds of Witness, please sign up. Why are all the book descriptions in Portuguese? Published in 1926, this is a terrific murder mystery by Dorothy L. Sayers. At a hunting house party, Denis Cathcart is discovered dead – shot through the chest and apparently dragged from some bushes some distance away to a spot near the conservatory door. Lord Wimsey (Gerald, or Jerry) left the house late at night and trips over the body on his way back to the house around 3:00 a.m. His sister, Lady Mary, also sees him and claims in the inquest that she heard a shot fired around 3:00 a.m. The g Published in 1926, this is a terrific murder mystery by Dorothy L. Sayers. At a hunting house party, Denis Cathcart is discovered dead – shot through the chest and apparently dragged from some bushes some distance away to a spot near the conservatory door. Lord Wimsey (Gerald, or Jerry) left the house late at night and trips over the body on his way back to the house around 3:00 a.m. His sister, Lady Mary, also sees him and claims in the inquest that she heard a shot fired around 3:00 a.m. The groundskeeper said he heard a shot at 10 minutes before midnight, but nothing later. Lord Wimsey had been heard quarrelling loudly with the deceased late that same night. Since Denis Cathcart was engaged to Lord Wimsey’s sister, Lady Mary, Lord Wimsey confronted him regarding some discrediting information which resulted in Denis Cathcart abruptly leaving the house. To make matters worse, the gun was Lord Wimsey’s own – kept in a drawer with the key in the lock. At the inquest, Lord Wimsey refuses to state an alibi for himself, and the mounting evidence indicates he is guilty of murder. There is a Grand Jury hearing, and the case proceeds. It must now go to The House of Lords for Lord Wimsey to be tried before a jury of his peers. Meantime, Lord Peter (Wimsey’s brother) and his friend from Scotland Yard (Charlie Parker) are chasing down clues and leads in England, in France, and ultimately even in the United States. Lord Peter may cast an appearance that is frivolous and shallow at times, but no-one can fault him as a brother. Even Lady Mary comes under suspicion when new evidence shows up that showed she lied about certain things in the inquest. Lord Peter does everything he can to get his brother freed from prison and to ensure his sister doesn’t take his place. This includes some frightening moments – being stuck in a bog and nearly losing his life there, not to mention his return flight from the United States when the plane is brought down due to bad weather – fortunately before it can crash into the ocean. There were several times – at least three or four – where I thought I knew for sure who the killer was. Even when reading books and I do know who dunnit, it is half the fun to figure out how it all happened. This time I was wrong – oh, so very wrong. And that was fun, too! I enjoyed this book immensely – even the stuffy atmosphere of the trial in the House of Lords was interesting, long concluding speeches and all! I am amazed at the quality of writing in this series and look forward to reading the third one. dashing peter wimsey dashes into some more dashing adventures. he's one of literature's greatest detectives. but just as enjoyable is his faithful manservant bunter. peter runs around figuring things out with his clever, clever mind but it is bunter who often gets his hands dirty with rather agreeable tasks like chatting up all the maidservants and various other domestics. tasks he clearly relishes but approaches with suave professionalism. various witnesses never fail to succumb to bunter's cha dashing peter wimsey dashes into some more dashing adventures. he's one of literature's greatest detectives. but just as enjoyable is his faithful manservant bunter. peter runs around figuring things out with his clever, clever mind but it is bunter who often gets his hands dirty with rather agreeable tasks like chatting up all the maidservants and various other domestics. tasks he clearly relishes but approaches with suave professionalism. various witnesses never fail to succumb to bunter's charms. he's the man! A man was shot dead, and all of the clues point to none other than Lord Peter Wimsey's bother who also happened to have a good motive for the murder. Lord Peter Wimsey is determined to find a real killer and to clear his brother's name. I hope I will not give a big spoiler when I say that he eventually succeeds in this. This is the second book of Lord Peter Wimsey investigations. It was disappointing for me. For starters, the characters were somewhat wooden with none of the charm and oddities of A man was shot dead, and all of the clues point to none other than Lord Peter Wimsey's bother who also happened to have a good motive for the murder. Lord Peter Wimsey is determined to find a real killer and to clear his brother's name. I hope I will not give a big spoiler when I say that he eventually succeeds in this. This is the second book of Lord Peter Wimsey investigations. It was disappointing for me. For starters, the characters were somewhat wooden with none of the charm and oddities of other great detectives: Sherlock Holmes and Hercule Poirot can remain calm as their title of the greatest detectives is uncontested by this newcomer - at least in this book. The main characters look bad even if I compare them to themselves in the first book. The main clue is presented at the very last moment making it impossible for the reader to arrive to the culprit's identity which is a fairly cheap trick. I also need to mention that the ending was way too melodramatic even considering the time the book was written and its genre. This delightful mystery is the second featuring Lord Peter Wimsey. When his brother, the Duke of Denver, is accused of murder then it is Lord Peter’s job to clear his name. The Duke is found standing over the body of his sister’s fiancé, who he has recently argued with about claims that the victim, Captain Denis Cathcart, was a card sharp. However, when questioned, he refuses to give a reasonable account of why he was wandering around outside, in the middle of the night. Why is he being so secre This delightful mystery is the second featuring Lord Peter Wimsey. When his brother, the Duke of Denver, is accused of murder then it is Lord Peter’s job to clear his name. The Duke is found standing over the body of his sister’s fiancé, who he has recently argued with about claims that the victim, Captain Denis Cathcart, was a card sharp. However, when questioned, he refuses to give a reasonable account of why he was wandering around outside, in the middle of the night. Why is he being so secretive and what is their sister, Mary, hiding? This is a wonderful, Golden Age mystery, with Lord Peter Wimsey and Charles Parker truly collaborating. There are some great, atmospheric scenes, most notably when Wimsey and Bunter are lost on the moors. The scenes in the House of Lords, where the Duke of Denver is tried, are also very interesting. Much of the fun in these books is in Wimsey himself and his light-hearted banter and eccentric behaviour. He is one of the greatest fictional amateur detectives and this is one of his best cases. Where I got the book: purchased on Kindle. A re-read. One thing I always appreciate about the Wimsey stories is that each book has a distinct character. 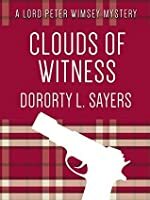 In Clouds of Witness the pace is fast and frenetic, with a wildly confusing murder mystery at the center, and yet Sayers does more to develop her characters here than in some of the other books. The mystery itself almost takes second place to the doings of Wimsey's family, placing Wimsey himself very firmly in a distinct social setting, his home Where I got the book: purchased on Kindle. A re-read. One thing I always appreciate about the Wimsey stories is that each book has a distinct character. 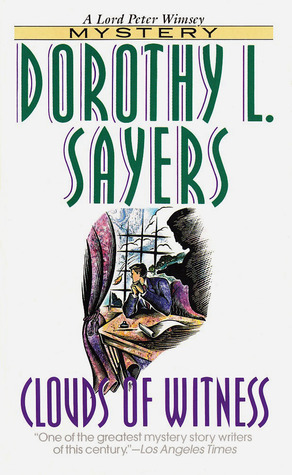 In Clouds of Witness the pace is fast and frenetic, with a wildly confusing murder mystery at the center, and yet Sayers does more to develop her characters here than in some of the other books. The mystery itself almost takes second place to the doings of Wimsey's family, placing Wimsey himself very firmly in a distinct social setting, his home turf where he seems more real than in many of the other books. He doesn't show off nearly as much when he's in the countryside, either; I can't help feeling that, titles aside, this is a depiction of the sort of society Sayers was raised in before she went off to London. I also enjoy the sketch of Wimsey's sister Lady Mary Wimsey, who turns up in later novels but only as a cardboard cutout (his brother Gerald never gets his character developed, which is a great shame). Watching Parker go all chivalrous and defensive of her is always amusing, albeit out of character. Mary is real in this book: later on, the Wimsey family becomes more and more a caricature of a noble English household, and Mary becomes a boring housewife, alas. Plenty happens to Wimsey in this book: he gets chased by dogs, shot, falls into a bog, and flies across the Atlantic (in the 1920s that was a noteworthy adventure). I have never seen a bullet wound heal with such great speed and thoroughness. There is an absolutely priceless little cameo of two writers talking about the trends of the day, something Sayers is able to pick up in the later novels once she writes herself in as Wimsey's love interest when Harriet Vane comes along. I absolutely zipped through this novel (which was supposed to be strictly a post-workout cool down read but ended up as a Main Book) despite having read it several times before. And that really defines the enduring success of the Wimsey novels; they're downright entertaining, and despite (or because of?) being set so firmly in a lost era, never seem to age. This is the best Sayers I have read to date! I found the beginning a little tiresome, but as soon as Lord Peter started his investigation my interest was engaged. Sayers writes with a dry wit that had me chuckling out loud in places, and reflecting on the social changes that have taken place in less than one hundred years. If anyone said "I wouldn't suggest such a thing to a woman, my lord. It goes to their heads, if I may say so." in these times, they would no doubt find themselves in court on ha This is the best Sayers I have read to date! Sayers writes with a dry wit that had me chuckling out loud in places, and reflecting on the social changes that have taken place in less than one hundred years. If anyone said "I wouldn't suggest such a thing to a woman, my lord. It goes to their heads, if I may say so." in these times, they would no doubt find themselves in court on harassment or sexual discrimination charges!....and "Ladyships don't boil water!" And talk about keeping it all in the family! Lord Peter's sister's fiancée, Cathcart, is found dead outside the conservatory of Riddlesdale Lodge, the family retreat, in the early hours of the morning. His elder brother Gerald, stands accused of the murder. And Lord Peter has the feeling that his sister Mary knows more than she is letting on. Aided by his friend in the police, Parker, and his irreplaceable valet Bunter, Lord Peter sets out to prove his brother's innocence and bring the true murderer to justice. This is a cracking good read in the best English Murder Mystery style. "Wimsey would be one of the finest detectives in England if he wasn't lazy"
This should give you a feel for the kind of cozy mystery series that is Lord Peter Wimsey. It is more slap stick than Agatha Christie and more "pip pip, old boy, good-o" English than her too. Dorothy Sayers works seem to me to be perfect for anyone who enjoys the writing of Agatha Christie and P.G. Wodehouse. Sayers imparts an acerbic edge that keeps things from getting too twee. She manages to make sharp observations on both the gentry and the socialists, sometimes at the same time. I’ve recently been cataloguing the works of H.G. Wells, who wrote a lot about socialism in the early 20th century, and I find Sayers’ insights on the complicated societal changes of this time period to b Dorothy Sayers works seem to me to be perfect for anyone who enjoys the writing of Agatha Christie and P.G. Wodehouse. Sayers imparts an acerbic edge that keeps things from getting too twee. She manages to make sharp observations on both the gentry and the socialists, sometimes at the same time. I’ve recently been cataloguing the works of H.G. Wells, who wrote a lot about socialism in the early 20th century, and I find Sayers’ insights on the complicated societal changes of this time period to be spot on. 'Joyce has freed us from the superstition of syntax,' agreed the curly haired man. 'The D.H. Lawrence formula,' said the other. Poor old Lawrence, maligned again for trying to express what he considered to be real emotions and realistic human behaviour in his novels. Being unable to express my review in either animal squeals or squirrel noises, I must tell you in English that this series is worth trying. Sayers may be the perfect mystery writer for me - she combines the plotting of Christie with the wit of Heyer & I get the wonderful Golden Age setting from all of them! Everything is improved (other than Bunter, he was already wonderful!) from Lord Peter while still insouciant is no longer Bertie Wooster playing at detectives. His is a well rounded character who lives a life filled with varied interests as well as his work as an amateur sleuth. So many witty quotations - I've added a couple Sayers may be the perfect mystery writer for me - she combines the plotting of Christie with the wit of Heyer & I get the wonderful Golden Age setting from all of them! So many witty quotations - I've added a couple to the GR data base! Clouds of Witness is wonderful. I was in the mood for a lovely mystery. This one seemed to fit the bill perfectly. I've decided to read these in order they appear on Goodreads. I liked Lord Peter Wimsey in Whose Body? and I loved him here. Not much has changed in this book. His quirks work so well in his world. In Clouds of Witness he is trying to save his brother (the Duke) who has been accused of murder. From their estate to Paris and back, from England to somewhere very far away, through the Clouds of Witness is wonderful. I was in the mood for a lovely mystery. This one seemed to fit the bill perfectly. In Clouds of Witness he is trying to save his brother (the Duke) who has been accused of murder. From their estate to Paris and back, from England to somewhere very far away, through the dangers of the moor and strange situations involving unexpectedly violent farmers, the Duke's side has their hands full. Lord Peter Wimsey, Bunter and Parker tirelessly work to find what exactly happened that night. The resolution is perfect. I found Peter's sister annoying as hell, but I guess certain things can be forgiven under the circumstances. Beside Lord Peter Wimsey, Bunter and Parker, one of my favourite characters ever is the Dowager Duchess. The plot is absurdly complicated, amusingly so. There are no end of intrigues in the country house where the murder takes place. But that's not the joy of reading a Sayers' novel: the pleasure is all in the humor. Wimsey acting a fool, Bunter's magical ability to produce anything needed, Mary's good heart, and the Dowager's formidable control of everything. It's Downton Abbey written by Oscar Wilde. I've been a Dorothy L Sayers fan ever since I borrowed Strong Poison from the school library when I was about fifteen. Sayers was a woman ahead of her time and not a typical writer of crime fiction. In 1912 she won a scholarship to Oxford University, achieving first class honours in French in 1915. Women could not be awarded degrees at that time, but Sayers was in the first group of women to be finally awarded their degree in 1920. She was a published poet and had worked in a publishing house, as a teacher, a translator and an advertising copywriter by the time the first of her Peter Wimsey novels was published in 1923. Later, Sayers moved away from writing novels and forged a new career writing essays and liturgical drama. Later still she embarked on what she considered her life's work: a translation of Dante's "Divine Comedy". Sayers brought fierce intelligence and uncompromising artistic integrity to all of her writing, including her crime fiction. She avoided the formulaic and consequently, even in the context of writing what turned out to be a series of novels featuring Lord Peter Wimsey, she didn't write the same novel twice. And unusually for a Golden Age British crime fiction writer, Sayers allowed her central character to develop over time. In this novel, the second in the series, Lord Peter's investigation is focussed on exonerating his brother, who has been charged with murder. In its set-up, it's a typical manor house mystery, of a kind now seen as old-fashioned, although when Sayers wrote the book there was nothing that old-fashioned about it. There are the expected twists and turns and a satisfying resolution, conveyed in Sayers' intelligent and witty prose. Jolly confounded story, old bean, what? Oh My, but was this book tedious, melodramatic and disappointing, not a patch on a pleasantly entertaining Book #1. If it wasn't for Ian Carmichael's excellent reading, I probably would not have finished at all. The concept of the the crime (view spoiler)[ that it wasn't a crime at all, but suicide (hide spoiler)] was interesting, but it was very badly done. It might have worked as a short novella, but was just too thin for a complete novel. All the red herr Jolly confounded story, old bean, what? All the red herrings thrown in and eventually leading nowhere just screamed *FILLER* and I found them utterly pointless and boring. This isn't my favorite of the Lord Peter novels – but as I'm sure I've said somewhere, that's like being my least favorite chocolate or my least favorite Beatle. And this does have some of my favorite Peter-Bunter scenes, and gave me the name for one of my blogs (Bompstable Cat, for the record). This isn’t so much a review as gathered musings on a book, a cast of characters, and an author near and dear to my heart. Peter is thirty-three in this book. At the very beginning it mentions "he had follo This isn't my favorite of the Lord Peter novels – but as I'm sure I've said somewhere, that's like being my least favorite chocolate or my least favorite Beatle. And this does have some of my favorite Peter-Bunter scenes, and gave me the name for one of my blogs (Bompstable Cat, for the record). "Ah! Your nerves are not all they should be. ...Nothing to be alarmed about, but you must exercise care while undergoing this strain, and afterwards you should take a complete rest. How about a voyage in the Mediterranean or the South Seas or somewhere?" The man may have been a murderer, and probably a psychopath, but he knew his field. Dorothy L. Sayers wasn’t afraid to make her murderer someone you didn’t really want to see in that role; I don’t remember my first reading of this, but I think there is, for a while, a genuine concern on the reader’s part along with Peter’s that Gerald might actually have dunnit. Among other things, Lord Peter Wimsey is known for blather. For nonsense. For, as Harriet Vane said, piffle. "Yes, old, thing?" said Peter affably, returning. "Happen he'll set dog on tha." "You don't say so?" said Peter. "The faithful hound welcomes the return of the prodigal. Scene of family rejoicing. 'My own long lost boy!' Sobs and speeches, beer all around for the delighted tenantry. Glees by the fireside, till the rafters ring and all the smoked hams tumble down to join in the revelry. Good night, sweet Prince, until the cows come home and dogs eat Jezebel in the portion of Jezreel when the hounds of spring are on winter's traces. I suppose," he added to himself, "they will have finished tea." In the seventy-six words of the above piffle (not counting the sensible first and last sentences), there are hits on the Bible (the prodigal son, and Jezebel; interesting she should come into the picture right here), and Shakespeare (Hamlet, "Good night, sweet Prince"), though the cows are a separate entity, inspired, one imagines, by the setting, and possibly a poem called “Edessa” ('My own long lost boy! '), and “The hounds of spring are on winter’s traces” is from the poem Atalanta in Calydon (1865)". I believe the hams are from Peter's own head, riffing off something, I have no doubt. It's nonsense – goodness knows what all jumbled together in a stream of consciousness irruption. From another character, another author, something like this might cause my back to go up and/or my eyes to roll, or other physical manifestations of annoyance. Peter is, the reader is told shortly, "a respectable scholar in five or six languages, a musician of small skill and more understanding, something of an expert in toxicology, a collector of rare editions, an entertaining man-about-town, and a common sensationalist". He has had an upper-class turn-of-the-century classical education, and is well able to process reams upon reams of poetry and prose in Latin, Greek, French, English, and I'm not sure what other languages – from nursery rhymes and music hall tunes to Plato and Voltaire – and in other hands than DLS’s I don't but doubt I might inform such a character or author where they might insert their classical education, and then I'd go hang out with Harry Dresden. (My version of a modern Lord Peter would produce piffle largely based off yes, Shakespeare, but also Doctor Who. And would without doubt say at some point "I swear by my pretty floral bonnet".) But Peter's piffle isn't meant to intimidate or put down a reader, or Peter's interlocutor, I don't believe. It's just Peter. It's Peter's Rube Goldberg mind that takes a warning about a farmer setting the dog on him: dominos fall, and a marble rolls down a channel, and a pulley slips down a string, and a bucket fills and tips and sends a little toy monkey waddling mechanically forward clapping cymbals which hit a switch, and at the end a flag goes up. Or something. But in a way it's the same kind of thought process, the same kind of association game that might be found in the head of anyone who has packed his brain for a long and rich lifetime journey. Only Peter vocalizes. He uses well-aimed piffle to confuse the hell out of people, and to make himself look harmless, and to make himself to look like an idiot – and just because. Maybe this example falls into the category of "making himself look harmless"; the farmhand is perhaps less likely to set the dogs on Peter after his exclamations, making him appear too effete and insubstantial to even worry about. I thought it interesting that both Peter and Parker think to buy their sisters (well, Peter's sister-in-law) crêpe de Chine scanties. It's perfect: Charles wanted to please his spinster sister with something pretty and rare which she would probably never buy for herself, which she could take sensual delight in wearing under her sensible clothing and no one else would ever know about it. (There's such a pathos to that "no one else".) Meanwhile, Peter wanted to shock his prudish sister-in-law by announcing in front of her guests that he planned to buy her something pretty and rare which she would probably never buy for herself, which she would disdain as frivolous and bohemian and for women of another, need I say lower, class altogether and wants to make sure everyone knows she would never wear such a thing. She irks him so thoroughly, and all he wants to do is blowtorch a hole in that frigidity. Scoring a hit in front of others would be perfect. I love that Parker is well able to conduct inquiries in France on his own. His French is not perfect – he is uncertain about his accent, and intimidated about the lingerie shop (though he goes for it anyway, bless him). And he flatters himself, pleased, that his accent is improving. I can just imagine a salesgirl taking him under her wing and thinking him totes adorbs. (Wait, that’s not French, is it?) I love Charles Parker. Though not as much as I love Bunter, and especially Peter. Their relationship is wonderful in this book. "Lord Peter stretched out his hand impulsively, but Mr. Bunter was too well trained to see it." It's easy to go in all sorts of directions with that line, and – to me – the obvious direction (shipping) is astoundingly stupid. This occurs right after Bunter reveals a bit about himself that Peter never knew – and realizes he has never looked into: Bunter's family. In all the years they've known each other, and Bunter has served him, Peter never inquired about his past. "Your mother, Bunter? I didn't know you had one. I always imagined you were turned out ready-made so to speak." That is – as per usual – flippant, but I think a moment later Peter's conscience smites him and he feels a need for Bunter's forgiveness. Friends don't neglect to ask after friends' mothers; friends don't fail to ascertain whether friends' mothers are in fact living or dead. Friends know how many siblings friends have. And these two are friends, despite the class divide and the fact that one is in the other's employ – they have been through the proverbial thick and the metaphorical thin together, and saved each other's skins, and owe each other a great deal. And Peter didn't know Bunter's mother was "seventy-five, my lord, and an extremely active woman for her years". I have to say I'm a little surprised at this; I would have said it's not like him. Perhaps it's simply that Bunter is so much a part of his life, a part of him, that he honestly never thought about his existence before the War. Bunter did arrive fully formed into his life, has never been so gauche as to intimate he has any other existence, and is always there. For the most difficult part of Peter’s life – most, in fact, of his adult life – Bunter has always been there, and as such a fixture in Peter's landscape has no separate reality: there was no Bunter before there was a Bunter-and-Peter. He's not the type, Mervyn Bunter, to chatter, and with six other siblings has no need to take time away from a job he loves to go and tend to his mother. Bunter's former home life has never been thrust into Peter's range of vision before. Also, I came across an really excellent online conversation which, in this, concentrates on that word "was": "I was one of seven." They posit that the use of the past tense indicates that at least some of the siblings have died – of influenza, or in the War. I'm not sure about that – it could simply be "I was one of seven at home" or "I was one of seven children she bore" without the more sober connotation. It's a very good theory – I like mine better, though: Peter puts out his hand in supplication, wanting to apologize for his ignorance about something he should have known. And Bunter, whatever was in his head, refrained from officially noticing; whether that means all is forgiven, or Peter didn't have to ask, or all is not forgiven… well, that's another set of speculations. When he leaves the room Peter is in high spirits, at least, so perhaps it can be inferred that whatever Bunter's mien and posture was as he ignored the outstretched hand, it was not a rebuff. And can I just say that this is one of the reasons I love DLS so much. There just aren't so very many authors in my experience (especially those best known as mystery authors) whose books spark that much thought over one line of text, and for whom such speculation is so rewarding. This Open Road text reads as a nice edition of the book, although peppered (as usual) with punctuation and transcription errors – but in checking text in another I find that it is sorely lacking in one thing: "This re-issue of CLOUDS OF WITNESS (which has received some corrections and amendments from MISS SAYERS) has for a Preface a short biography of Lord Peter Wimsey, brought up to date (May 1935) and communicated by his uncle PAUL AUSTIN DELAGARDIE." This edition has the brief bio and heraldic information, but not the essay from Uncle Paul. It's a crime that this is left out. And of course I love the following so very much that I named a blog after it. In fact, let me go see if the name is available elsewhere … I’m not much of a cat person, but bompstable cats? Oh my yes. But now he had really got the formula he wouldn't forget it again. The connection was just there - close, thick, richly coherent. "The glass-blower's cat is bompstable," said Mr. Parker aloud and distinctly. "I'm charmed to hear it," replied Lord Peter, with a friendly grin. "Had a good nap, old man?" "I--what?" said Mr. Parker. "Hullo! Watcher mean, nap? I had got hold of the most important train of thought, and you've put it out of my head. What was it? Cat--cat--cat----" He groped wildly. "You said 'The glass-blower's cat is bompstable,'" retorted Lord Peter. "It's a perfectly rippin' word, but I don't know what you mean by it." "Bompstable?" said Mr. Parker, blushing slightly. "Bomp - oh, well, perhaps you're right - I may have dozed off. But, you know, I thought I'd just got the clue to the whole thing. I attached the greatest importance to that phrase. Even now - No, now I come to think of it, my train of thought doesn't seem quite to hold together. What a pity. I thought it was so lucid." Parker's eyes wandered to the photographs. "I don't believe it," he said obstinately. "I'm damned if I'm going to believe a word of it." Woop – there goes Charles, I believe. I am an outlier, grading grande dame Dorothy Sayers with two stars. I am stunned this is a favourite for some folks and imagine fandom comes into it. I have specific points of criticism. However, I have collected the works. I found the beginning boring, a transcript of Gerald’s sentencing and Peter’s drunk ending was arbitrary. However I warmed up to him, his family, and friends and began to enjoy myself in the middle. I loved their lawyer’s humour and impeccable vocabulary, which always delights I am an outlier, grading grande dame Dorothy Sayers with two stars. I am stunned this is a favourite for some folks and imagine fandom comes into it. I have specific points of criticism. However, I have collected the works. I found the beginning boring, a transcript of Gerald’s sentencing and Peter’s drunk ending was arbitrary. However I warmed up to him, his family, and friends and began to enjoy myself in the middle. I loved their lawyer’s humour and impeccable vocabulary, which always delights me. I got Peter’s humour and ease with people. I no longer think he is vain, even if the idea of Bunter living in-house, pouring baths bothers me. We acquaint Peter’s family and nothing beat the triumph of an abused woman freed. It was odd that no child was mentioned when she left. I don’t imagine how an airplane trip was dangerous in 1926 and why elements would reach passengers. However, I was impressed with the legwork Peter, Bunter, and Charlie did in England and Paris and loved the French. Better than scattered phrases, we were treated to a grammatically-perfect French letter, translated for those who needed it. This is the second of the Lord Peter radioplays, at least going chronologically by the order of the books. It’s longer than Whose Body? and a bit more personal: Lord Peter has to defend his own brother, the Duke of Denver, against a charge of murder. As usual with the Wimsey radioplays, the cast is excellent, and the parts chosen directly from the novels for dramatisation are great. I think only Ian Carmichael could get exactly the right tone for me in the part where Wimsey climbs on Parker’s back, looks over the wall, and then announces that it’s a marvellous ditch which he is going to proceed to fall into. The main thing that doesn’t really work for me is, unfortunately, the sound effects. The gun sounds are more like party poppers — hardly the dramatic scenes needed. And I could maybe wish that Ian Carmichael wouldn’t sing — it’s in character, but something about it grates. Recommends it for: Fans of "light" mysteries. Recommended to Ann by: Katie - thanks! "Clouds of Witness" was a very delightful book! In both the mystery and the characters, I thought Sayers came through brilliantly! Lord Peter Wimsey (the main character and detective) is truly a humorous, clever, thoughtful, and lovable character! He breezes through life, always seeing the amusement and humor in situations, but doesn't lack the ability to understand people and events for the gravity they may hold. 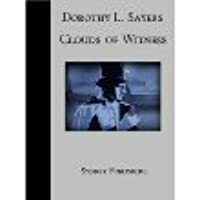 Wimsey himself was a delightful enough character to hold my interest through the bo "Clouds of Witness" was a very delightful book! In both the mystery and the characters, I thought Sayers came through brilliantly! Wimsey himself was a delightful enough character to hold my interest through the book, but add to this his good friend (and partner in crime-solving) Mr. Parker (adorable friends!) and Mr. Bunter (another more "proper" counterpart to Wimsey) and you have an entire book set to amuse! Oddly enough, Sayers doesn't use a lot of description. In a way it reminds a bit of Jane Austin (though the feel of the books is not similar! ), in her ability to convey the characters in their uniqueness and completeness through dialogue. The mystery also is most interesting. And while I could have felt "cheated" by the ending, I didn't because of the various sub-mysteries that were occurring throughout the book. It is, in a way, three or four mysteries all revolving around one. Additionally, the mystery centers around Wimsey’s own family, which adds another element to Wimsey’s character, and the mystery itself. A note: the book does contain a few slightly graphic descriptions of the murder, but I stress the word slightly. I have read some Agatha Christie, and think that it’s probably on par with those. I am quite the queasy reader, and I had few qualms. The only thing I regretted – if it could be called a regret – was the prevalent use of French. I can’t blame or criticize Sayers on this front, only myself for not having a better grasp of the language. That said, while a times I was dismayed because I did not understand every detail or clue, for the most part everything was eventually (and in a timely manner) translated or explained. Recommends it for: fans of good mysteries, especially 1920s era British ones! Lord Peter Whimsey is just finishing up his post-murder vacation when he gets the news that his brother has been arrested for the murder of his sister's fiance. He races back to England in order to discover what everybody was up to in the nighttime in order to get his brother acquitted. In the process, he gets shot, visits multiple other countries, goads his family a bunch, and ultimately frustrates a whole lot of lawyers. 1. In the whole, this was disappointing. The overreaching story never see Lord Peter Whimsey is just finishing up his post-murder vacation when he gets the news that his brother has been arrested for the murder of his sister's fiance. He races back to England in order to discover what everybody was up to in the nighttime in order to get his brother acquitted. In the process, he gets shot, visits multiple other countries, goads his family a bunch, and ultimately frustrates a whole lot of lawyers. 1. In the whole, this was disappointing. The overreaching story never seemed to come together into anything truly engaging; this was very much a book of pieces and parts. There were individual scenes that were phenomenal (Bunter handily collecting evidence as he flirts with the frustrated maid; Peter handily telling Parker he's fine with Parker knowing all his family secrets; Parker's inflamed chivalry for the secretive Mary; Peter and Gerald/Jerry facing off across Jerry's jail cell; the Dowager Duchess wryly commenting on the pomp and circumstance of the Duke's trial; I could go on), but the through-lines were just...not present. I put down this book honestly disappointed in it—in both the mystery and in the characters. 2. I hope Parker gets the girl!! 3. For as much of Peter's family was in this book, it definitely left a lot of detail out? I guess I'm just reviewing what I do know of the Whimsey family and realizing that it's all a lot of shadows and names—a mystery in and of itself! This one sets Peter Lord Wimsey's birth family into their core characteristics. The case is seated in their very midst. His brother Lord Denver is arrested on murder charges. Did he kill their sister's fiance? I loved it. The first half is slow and also, IMHO, quite humorous considering the dire straits for all the family. And you get the first senses of their mother's deep character now, too. Dowager Duchess of Denver (is there a better title that sings itself with all that alliteration!) never This one sets Peter Lord Wimsey's birth family into their core characteristics. The case is seated in their very midst. His brother Lord Denver is arrested on murder charges. Did he kill their sister's fiance? I loved it. The first half is slow and also, IMHO, quite humorous considering the dire straits for all the family. And you get the first senses of their mother's deep character now, too. Dowager Duchess of Denver (is there a better title that sings itself with all that alliteration!) never blinks, common sense and practical applications as stalwart as ever. Lord Wimsey and Bunker are all over the place and nearly end their existences in a bog, within a fog. There's tons of dialect in this one and at least 1/2 of the copy seems in "sound" English rather than proper standard English. But it's delicious. There's a monster mean husband abuser and all kinds of lying going on. The sister Mary- from the beginning. And we also see the future of this naive social warrior idealist despite her terrible taste in men- taking a possible turn for marrying down, instead of just marrying bad. It also has a top notch ending. Not all of these series have endings that go BANG. This one absolutely does. Reading it after some of the much later, I have to admit that this is one that gives you much pivotal exact family member character and core. Enough that you get full nuance for/ in the future sensibilities or awareness factors between the main 6 or 8 central characters in this series. I'd have understood some of the much later novels in Lord Wimsey count to a clearer, unspoken onus degree to trusting or doubting relationship, if I'd have read this one previously. I just love Lord Peter. Very frivolous, but totally serious about his crime-solving! In a way, he's like Columbo. (Not fashion, obviously.) He is underestimated by his adversary because of the front he puts to the world, but when you come right down to it, they're doomed. In this story, we learn more about Lord Peter and his family when a murder comes to the heart of his aristocratic family. Very fun what with adultery, card sharps, elopements and Soviets! Love Dorothy Sayers, a great mystery writer that parallels the work of Agatha Christie. Lord Peter Wimsey and this 2nd installment was better than the first now that I am quite used to the lingo etc. I loved the description of the fog that rolled in (pg 274, I have the 1-3 book version ) and the scene that unfolded in the bog....."uphill or downhill seems much the same thing in a fog. But man walks in a vain shadow. It is hard to believe that one is really helpless." Coincidences, mentioned in e Love Dorothy Sayers, a great mystery writer that parallels the work of Agatha Christie. Lord Peter Wimsey and this 2nd installment was better than the first now that I am quite used to the lingo etc. I loved the description of the fog that rolled in (pg 274, I have the 1-3 book version ) and the scene that unfolded in the bog....."uphill or downhill seems much the same thing in a fog. But man walks in a vain shadow. It is hard to believe that one is really helpless." Considering how close to Peter the story is — given his own brother is accused of the murder of his sister’s fiancé, with his sister as a witness — it doesn’t seem as close to the character as we were during the last chapters of Whose Body?, where Peter is having his PTSD episode/recovering from it. Still, there’s plenty of interaction with Parker and Bunter, and plenty of Peter poking his nose in where it’s not wanted (and sometimes where it is wanted, in that timely manner he has). And I have to confess that I really like the way Parker’s affection for Mary is shown, and his interactions with Peter about it. Десь раз на рік я здійснюю спробу зрозуміти, what's all the fuss about Lord Peter Wimsey, й слухаю аудіокнижку якогось із романів серії. Оскільки зазвичай я встигаю забути все, то часто це той же роман - а потім дивуюся, чому результати послідовно незадовільні (зазвичай це Whose Body?, відгук тут). Зараз зсунулася вбік на роман, який ще не читала, й потішилася більше. Коротше, це дитя Дживза, Вустера і Шерлока Холмса - заміські маєтки, екстравагантні знайомці, тітоньки, яких усі бояться, молодь Десь раз на рік я здійснюю спробу зрозуміти, what's all the fuss about Lord Peter Wimsey, й слухаю аудіокнижку якогось із романів серії. Оскільки зазвичай я встигаю забути все, то часто це той же роман - а потім дивуюся, чому результати послідовно незадовільні (зазвичай це Whose Body?, відгук тут). Зараз зсунулася вбік на роман, який ще не читала, й потішилася більше. Коротше, це дитя Дживза, Вустера і Шерлока Холмса - заміські маєтки, екстравагантні знайомці, тітоньки, яких усі бояться, молодь із аристократичного прошарку, що заграє із соціалізмом, і доволі химерні матримоніальні плани, але з трупами - але цей том іронічніший щодо свого походження, ніж попередній, свідоміший того, що він пахне чорнилом, що його генеалогія суто літературна. Чим і підкуповує більше, попри всі нагромадження сюжетних натяжок. Not the best in the series but not bad. In this installment of Lord Peter Wimsey’s detective series, Peter’s older brother, the Duke of Denver, is accused of murder. The Duke is strangely silent about his alibi although he insists that he is innocent. It’s up to Peter to get his brother out of the murder charges. Along the way, Peter uncovers piles of confusing evidence, most of which complicate the case and some of which he never wanted to know. So much has been going on under the stubborn duke’s nose, no wonder the police are stumped as to who did what and why. And was there any connection between the murder and the other suspicious circumstances or was it all just a convoluted series of coincidences? Peter is his usual chatty self, and lots of what he says is in reference to some obscure literary masterpieces I’ve never heard about, so I didn’t read all his nattering with as much attention as it probably required. On the other hand, there are several revelations in this book that reflect the times and the author’s point of view, not always flattering to certain tiers of society. I couldn’t resist a few brilliant quotes. Some of it is still true today as it was at the time of publication in 1926. Here Peter talks to his brother’s defense attorney, Sir Imprey. Here is another snippet – between Peter, his sister Mary (the former betrothed of the murder victim), and their family lawyer, Mr. Murbles. ‘I beg your pardon, Polly,’ said Wimsey. ‘One of those watertight compartment minds,’ said Wimsey thoughtfully. And here is the characters’ opinion about old headstrong ladies. I wouldn’t recommend anyone to start the series from this story, but for anyone already familiar with the charismatic detective, Lord Peter Wimsey, this book is a must. This is the only book where I feel a little bad for Helen. My favorite moment is probably when Peter goes to visit Denver in jail and they look at each other, each seeing his own features in the other's face, each unable to figure out why his brother thinks the way he thinks. It's that family angle that saves this book, because the mystery is, frankly, a letdown. This is the second book in the Peter Wimsey series and is simply delightful. His brother, the Duke of Denver, is arrested at a family's "shooting box", Riddlesdale Lodge. The murdered man is the fiancée of his sister, Mary. This novel really gives you a look at Peter and his family. There is not enough of the Dowager Duchess but it's fun getting to know his siblings. Bunter is someone I want in my life. He runs Peter's bath water, brings him breakfast in bed and pulls him out of quicksand. Pete This is the second book in the Peter Wimsey series and is simply delightful. His brother, the Duke of Denver, is arrested at a family's "shooting box", Riddlesdale Lodge. The murdered man is the fiancée of his sister, Mary. This novel really gives you a look at Peter and his family. There is not enough of the Dowager Duchess but it's fun getting to know his siblings. Bunter is someone I want in my life. He runs Peter's bath water, brings him breakfast in bed and pulls him out of quicksand. Peter's life? Who wouldn't want it? He's waited on hand and food, has no money worries and spends his time looking for rare books. It sounds like heaven to me. Readers who like 1926 tongue-in-cheek detective stories of manners and fans of Downton Abbey, will find this just their cup of tea. Others, not so much. The reader is assumed to be literate in French, which I'm not. I muddled through. Lord Peter's brother, the Duke of Denver, is accused of murder. Suddenly Peter's embarrassing hobby--sleuthing--may save Duke Gerald’s title ... and neck. The title gives away the twist: too many witnesses to too much, some of it misleading or simply untrue. I’ve read this book before. Don’t know where or when. I suspect in ebook format, so it couldn’t have been that long ago.